Divide your weight in half and that’s how many grams of protein you need per day. So if you are 100 pounds, you need 50 grams. If you are 150, you need 75 grams. Check nutrition labels to see how many grams are in each serving of your chosen food. Tip: A 4-oz serving (little bigger than a deck of cards) of chicken provides 31 grams of protein, so 3 servings the size of your palm should suffice most people’s protein needs. If you’re an avid exerciser looking to build lean muscle, or body building, you will require about twice that. So just use your weight as your guideline for how much protein you need. Skeletal muscle is approximately 72% water, 22% protein, and 6% fat, glycogen, and minerals, and 1 pound of muscle tissue contains approximately 100 g of protein. Theoretically, an athlete would have to ingest an extra 14 g of protein per day. Although, most experts believe the single most important factor in gaining lean mass (along with resistance training, of course) is consuming adequate calories. Therefore, to ensure the body has sufﬁcient energy for lean mass accretion, consume an additional 200 to 400 calories daily above maintenance requirements in addition to consuming a little extra protein (approximately 2 ounces of lean meat). As you can see from the image above (which I love), vegetarians can get plenty of protein from plant sources. 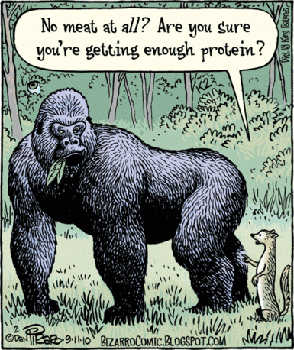 Personally, I don’t eat meat and get my protein from various sources. (Although…I do eat sushi and partake in that once a month or so.) My favorites are quinoa, grilled tofu, lentils, almonds, tempeh, spirulina (shake), hemp seeds, black beans, hummus, kale, spinach, brown rice and seitan (wheat meat). Oh! And you can’t forget peanut butter. Mmm!